Mix pumpkin, milk, eggs, cinnamon, ginger, and cloves. 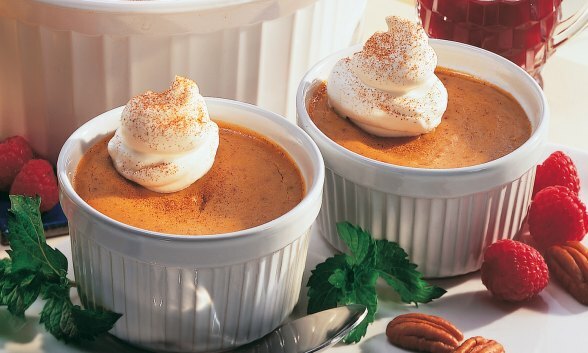 Pour into eight 6-ounce custard cups. Cover each securely with aluminum foil. Place cooking rack or steamer basket and water in a Presto® pressure cooker. Place custard cups on rack or in basket using the positioning instructions below. Close cover securely. Place pressure regulator on vent pipe. Cook 10 minutes at 15 pounds pressure. Cool cooker at once. Remove custard cups to cool on wire rack. Repeat above procedure, if necessary, to cook remaining custards. Refrigerate until chilled. Serve with whipped cream. Place two custard cups on cooking rack. Then, stack the other two custard cups opposite the bottom two custard cups. Place three custard cups on cooking rack. Place three custard cups on cooking rack. Then, stack the other three custard cups opposite the bottom three custard cups. Place four custard cups on cooking rack or steamer basket. Then, stack the other four custard cups opposite the bottom four custard cups.